The man behind Diwali's big release Ra.One -- Anubhav Sinha -- has spoken quite candidly about the film, in an extensive three-part interview with Sonil Dedhia. You can catch part one and part two here. 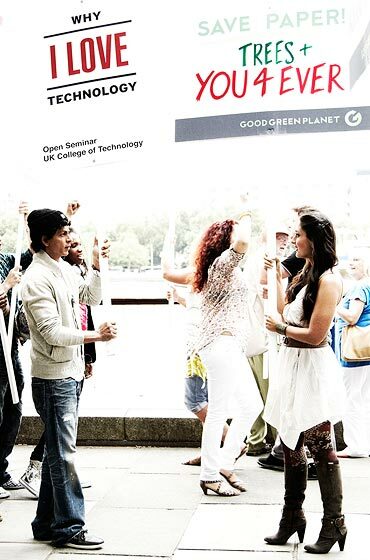 You have two of the biggest stars -- Shah Rukh Khan and Kareena Kapoor -- in Ra.One. Why did you cast more stars, like Sanjay Dutt and Priyanka Chopra? I love Sanju. I had made some small budget films before I made Dus. When I met him with the script of Dus, Sanju became the executive producer -- he got me to the right actors and producers, and helped me through the film. I needed a particular character for a cameo in Ra.One and the first name that came to mind was his. Similarly, there was another character of a lady. Since we had one star (Sanjay Dutt), we thought of roping in another star and who better than Priyanka Chopra? Is Ra.One India's answer to Hollywood? Answer to Hollywood sounds aggressive. In terms of the kind of films and stories that Hollywood and other film industries in the world offer, they are almost 10 to 15 years ahead of us. Our movies are not really recognised on the world platform. As a commercial proposition, we are growing big time, and will definitely get bigger. I would not say Ra.One is an answer to anything. Tell us about the film's special effects. 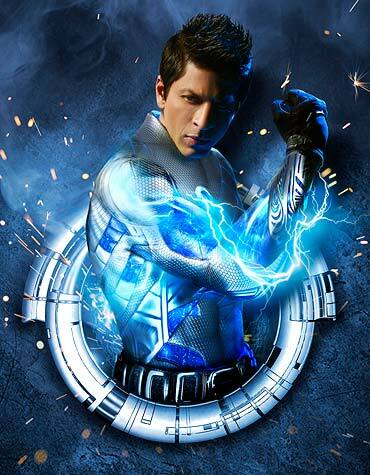 Do you think Ra.One has taken India a step ahead in terms of VFX? When I look at Ra.One, I can proudly say that. But that doesn't prove I have mastered the art of VFX. It only proves that in the near future, we will see advanced technology in our films. You were quoted saying that VFX is almost as important as an actor. Yes. Films like Finding Nemo and Kung Fu Panda don't require a star, they require the right VFX. Ra.One is a 150 minute movie and 70 percent is VFX. The challenges faced were really tough -- complexity of the shots and sequences, syncing the entire production pipeline and keeping tab of the progress and finally, quality control. How did the film end up in 3-D? While we were shooting the film, we were approached by a lot of studios to make the film in 3-D. But we were so busy shooting, we did not pay attention. They converted a trailer and we were just awestruck by it, so that's how we decided to go by it. What special arrangements were done to design the suit for G.One? I went through the entire library of superheroes to see what had not been made into a film. I even wrote a 23-page document to the designer explaining what I was looking for, with images sketched. It took two to three months to design the suit and the same amount of time to make it. Indian films have not been able to capitalise on the superhero genre. Films like Drona and Aladin failed miserably. I think Drona and Aladin were brave attempts. I might not have like them but I respect the cast and crew of these films. There are a lot of things that can be learnt from these films. I would not classify them as bad superhero films. The visual effects in any film take a lot out of the people who are working on it. I respect Sujoy Ghosh and Goldie Behl for what they have done. Unless we don't applaud their attempts, new filmmakers wouldn't try to encourage these kinds of films. The media talks about the failure of superhero films in Bollywood which holds true commercially, but I don't think there has been a single actor who hasn't delivered a flop in his career. It's with trials and failure that one cracks the code and I am hoping with Ra.One, I have cracked the code. Don't you think Bollywood has not been able to create superheroes? Yes. I have been studying this genre. India never has had a culture of comic books. The only memory that I have comic books go back to the 1970's when I read Phantom and Mandrake but they were not Indian superheroes. The only Indian superhero we had was Bahadur created by Abid Surti. For me, Gandhi was a superhero and unfortunately, a non-Indian made a film on him. The problem is India started to borrow superheroes from other countries. We were too late to recognise the concept of superheroes and now when we look back we realise that we had superheroes in our own mythology. So far the treatment of Hanuman has been of a monkey but the question arises that can he be seen as a superhero? It will take a creative mind to make it happen but it's not too far into the future. I may do it myself. Was it difficult to convince Shah Rukh Khan when you approached him for Ra.One? When a film flops, people stop answering your phone calls. This happened to me after Cash. The only person who was in touch with me was Shah Rukh Khan. I didn't suffer as much as everybody thinks. Shah Rukh is the only person who remained unchanged after Cash. We all make hits and flops but that doesn't mean that anyone has lost the capability of making films. He believed in me. I narrated Ra.One to Shah Rukh just after Dus had released which wasn't a blockbuster but it was a successful film and he was about to start shooting for Kabhi Alvida Na Kehna. Cash was not only a flop but also it was panned but he has a vision. Recently, he was quoted saying that I am one of the finest directors in the country and that shows that he has always believed in me. I just saw an image and the first thought that came to my mind was a human being controlled with a remote. When I first went to Shah Rukh, it was a premature presentation of the film. He saw beyond what I had narrated. Within five minutes of the narration, he asked me when I wanted to make it. Do you now find yourself questioning decisions made in the past? Yes but I don't regret making any of them. I regret releasing Cash as it was an incomplete film. Ten days worth of scenes were not there in the film and that's the reason the audience didn't understand the film. There was a lot of money riding on the film and I had to release it. Do you feel your earlier films lacked this clarity you seem to have now? After Tum Bin, some actors were willing to work with me. I remember right after the film, Salman called me over and said let's do a film together but I didn't have a story that would excite him then. My second film could have been with Salman Khan. After that I became a commodity that could create a viable project but didn't realise that at the end of the day, it is all about telling a story and I think I got lost somewhere. In a way, I am thankful that Cash happened to me as I had the time and the mind space to reassess my priorities. After Ra.One, I will always make a film that is close to me. What made you get into direction at the age of 26? I did my engineering but did not like what I was doing. I quit my job one day and for almost a year, I was exploring various options ranging from working in an advertisement agency to filmmaking. I knew I wanted to do something in a creative field and my friends brother offered me a role of an assistant director for a small documentary and that's when I knew I wanted to be a director. Shah Rukh's kids Aryan and Suhana and your son Shlok have also played an important part in the making of the film? We have made the film for our kids. There were some important decisions which were made by them. Shah Rukh would call me and ask me if Shlok liked and vice versa. We would continuously take their feedback and if they didn't find something interesting we would discuss it and try to make the scene better. Their votes mattered a lot. So you can say they have assisted you? (Laughs) Yes they have been the seventh and eighth assistant directors of the film. Gauri Khan is also a producer on this film. Did she give you feedback? She was a great encouragement and very supportive. She didn't give any feedback because according to her everything we did was good. She only says nice things. She loves the film and always tells us not to be worried about the result of the film. Lastly, are you looking to turn Ra.One into a franchise? Yes. Such films are inherently meant to be a franchise. There are no two ways that Ra.One is franchiseable and also merchandisable. Rate Deepika, Freida's style quotient!